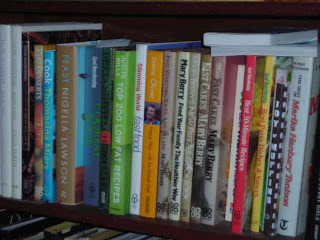 Farmersgirl Kitchen: My cookery books - too many? 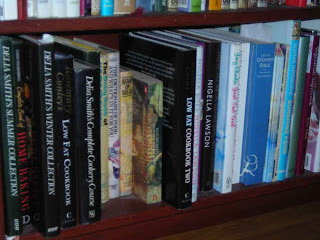 My cookery books - too many? I just thought I would like to show off my cook books. 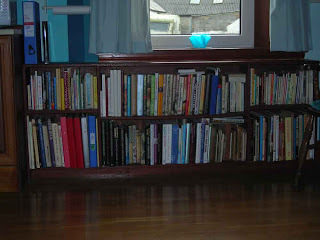 When we had the wooden floor put in the kitchen, I asked the joiner to create some shelves under the window for my books. He made some shelves to accommodate the taller books as well. In theory, I'm supposed to get rid of one book before I can buy another one, but you can probably see that there are one or two which have been slotted along the top. I don't use them as much as I used to, I like magazines to give me instant inspiration and also use the internet for recipes, but there are many favourites there. I was quite shocked this Christmas though, my sister gave me Madhur Jaffrey's Curry Bible and I was really pleased, made something from it and thought it was great. About a week after Christmas, I noticed that I already had the book!!!! I had completely forgotten about it. Labels: Christmas, Cook Books, curry. In the last few months, you may remember receiving an email invitation to become a part of the Foodbuzz Featured Publisher Program. With all the recipe-writing and food photography to be completed, we know emails can easily get lost in the shuffle, so Foodbuzz would like to re-extend our offer of inviting you to be a part of our food blogger network. I would love to send you more details about the program, so if you are interested, please email me at Shannon@foodbuzz.com. I'm not really foodie but I have loved looking at this blog and trawling through some of the links!